Line your entire walkway or garden with the dramatic look of stone using these Gardeneer Grey Stonewall Faux Stone Border Edges. The grey color and textured façade throughout this fencing bring a realistic, stone look to each piece, while the hardy plastic construction offers versatility. The grey tone and dark accents lend dimension to your yard, while the interlocking design of the units allows you to create unique curves or angles. These dual-level segments form a solid and lasting foundation for the edging, and the 6" height creates a wonderful focal point. The top sections each have a tab to insert into the slot on the base sections, forming an interlocking design, while smaller, bridge pieces create a solid, unified look. Use the included, 9.5" long, metal nails through the holes in each bridge section to anchor your fencing to the soil. The hand applied, grey finish brings an artistic and individualized look to each piece, and the bridge sections may be shortened or arranged at an angle for a truly customizable border. The plastic body lasts for many seasons, and each box covers up to 9.75 linear feet. Bring a striking border to your garden or landscaping with these Grey Stonewall Faux Stone Border Edges. 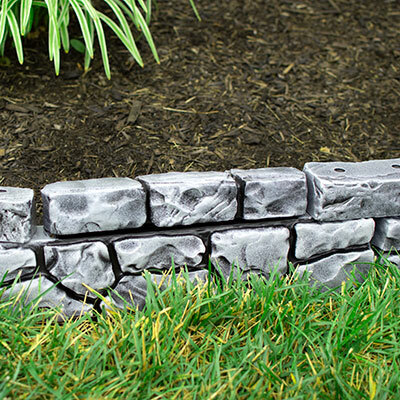 Note: This case pack includes 4 boxes of the Gardeneer Grey Stonewall Faux Stone Border Edge.